This factsheet is adapted from a blog post and the section in my Healing Plan. Are We Suffering From Central Sensitivity Syndrome? In CSS, the body is basically hyper-sensitive and, in Fibromyalgia world certainly, where the topic has been gaining credence, it is showing itself as diffuse body pain mainly. One of the best descriptions I have heard of CSS is that it is sort-of a ‘disease of over-sensitivity to threats’. Some more psychiatric disorders can occur with CSS too, including depression, OCD, bipolar disorder, PTSD (post traumatic stress disorder), GAD (general anxiety disorder) and panic attacks; more on why this happens later. The best analogy I have found for CSS is that of an electric guitar and an amplifier. You can strum the guitar in loads of different ways (epigenetics) but the volume of what comes out is controlled by the amplifier. If your amplifier is up high (think Spinal Tap! ), you are going to feel things more. Some people have their amplifiers set on high, others low. Sufferers of CSS have higher than normal settings. This basically means that signals (such as pain in FM, pain from a food reaction, any reaction to a perceived threat etc) that shouldn’t get through from the spinal cord to the brain do so and CSS sufferers feel them more than someone whose amplifier settings are normal. That’s a very simplified way of putting it, of course, but I get it best when it’s nice and simple! Incidentally, much of my information from her on in, was gained from a fantastic lecture, free on YouTube :), given by Professor Daniel Clauw, a Canadian clinical neurologist who has been doing much of the research into CSS. It’s over an hour long but fascinating. I will link to it at the end for you to go and watch it if this strikes a chord. CSS refers to centralised pain or symptoms. That means it is controlled by a brain-amplified activity, not by inflammation or immune activity in the local area. Wow! That is BIG news. The understanding that pain comes from damage or inflammation in localised tissue is now outdated (if not entirely accepted yet by people not in the neurology field). The notion that arthritic knee pain is caused by loss of cartilage and rubbing of the bones together etc no longer stands up, if you’ll forgive the pun. All pain is in the brain’s response to a signal. It is literally all in your head. And, again, if you need evidence of this, watch the Prof Clauw video and also this one, from Dr Lorimer Mosely’s TED Talk Why Things Hurt, which is actually very funny and a 15 minute explanation for you. How Do I Know If I Have CSS? Abnormal pain ie. somehow heightened or always there in some way. Pain is often a nerve type pain rather than sharp – described as gnawing, burning, stabbing, deep etc. It might be useful here, in fact, to test the FM pain points; I often find many hypersensitives can score the same high levels (FM is 11 out of 19 points, I think). Usually other symptoms especially fatigue, sleep issues and memory difficulties (I know this sounds like FM, but you need to understand that FM is part of the CSS spectrum it seems, so many hyper-sensitivity conditions will also have these other symptoms). Usually sensitive to other stuff to, eg. light, temperature, noise, smells etc. Tend to suffer from depression, distress, anxiety, not least because of the bloomin’ pain, but also because the same neurotransmitters involved in the amplification process affect mood. What Causes the Higher Amplification? There are two main pathways to pain in the brain and central nervous system, as far as I understand it as it relates to CSS anyway, and those either increase pain signalling or decrease it. Both are controlled by specific neurotransmitters. Here is a copy of one of the slides for you from Prof Clauw, which shows the different neurotransmitters involved. Can You Test For Central Sensitivity Syndrome? In other words, people’s neurotransmitter levels are up the swanny in various ways. Note that those neurotransmitters are also involved in various mood disorders so it is not surprising that many CSS sufferers are also going to suffer with, or have their sensitivity heightened by, conditions like chronic anxiety, depression, trauma etc. They are so interlinked. The trick, in this case, presumably is going to be dialling that amplifier back down again neurotransmitter-wise, but also dealing with the PTSD original trigger, if indeed that’s what it was. Women, especially those menstruating are 1.5-2 x more likely to have CSS. Pain is worse just before menstruation. Genetics are involved (the SNiPs are in the Clauw video). There is usually a family history of pain in more people than you would expect in the general population (only 1 in 3 suffer chronic pain and it’s usually about a third of family members on one or both sides in CSS families). Early life stress (ie. in childhood) appears to be a biggy (again), as does post traumatic stress disorder (see above!). Over time, the consequences of chronic pain/sensitivity make things worse and we go into a spiral. We become more and more distressed by what’s happening to us, we isolate ourselves more as we have to cancel appointments and become generally less active and not doing fun things, we don’t sleep well and we get stuck in ‘survivor’ type techniques eg. doing loads on good days, which is a known pacing issue that only make flares more likely to happen afterwards. Sleep and activity seem to be key. How Do We Turn Ourselves Down? This is what we all want to know, isn’t it?! 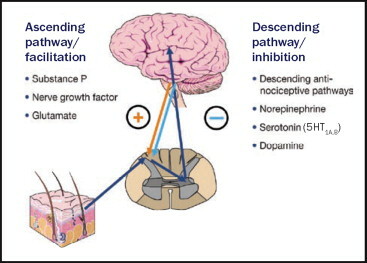 There are basically two prongs of attack: deal with the epigenetic/lifestyle side of things and specifically addressing the neuro pathways that limit pain signalling (as per the diagram above). Make your life “safer” and less stressful. Gentler. Easier. Centralization of pain is the process of the central nervous system’s “opinion” of the situation becoming more important than the actual state of the tissues. This is not an “all in the head” problem, but a “strongly affected by the head” problem, like an ulcer that is caused by a very real bug but is severely aggravated by stress. I have outlined in depth the techniques to help us feel more safe and, most importantly, get that message across to our bodies in the Healing Plan. The second prong is meds. I don’t normally advocate a lot of drug use and I need to look more yet at natural alternatives to the meds, but sometimes meds can be literal lifesavers. At the very least, in this kind of hyper-sensitivity circumstance, it might be a useful short-medium term strategy whilst you sort the epigenetics bit out. I’ve not read much yet on whether medication is thought to be a long-term thing or short-term; this is not my field, of course. You need a pain clinic doctor, I think, for this. However, the usual pain meds like steroids, NSAIDs and opioids are not appropriate here and are unlikely to help much if the pain is CSS. In fact, there is a thought that chronic opioid use could be turning the amplifier up (see low dose naltrexone later – this actually works by lowering levels of body opioids, which it is thought CSS sufferers make far too much of internally). What’s required are meds that work on the neurotransmitters. (Much more on this is in the Clauw video, please refer to it before willy-nilly taking anything or marching in to see your doctor). Research suggests so far that the strongest candidates helping people include the tricyclics such as amitryptiline and cyclobenzapine (US only? ), SNRIs and NSRIs eg. duloxetine and venlafaxine and specific types of ligand anticonvulsants such as pregabaline, neurontin and gabapentin. Now, I know what you are thinking: these are ruddy antidepressants, this is NOT all in my mind!!! Gnashing of teeth etc. I know they are, but remember I said the same neurotransmitters that control pain signalling also control mood so that is not surprising then is it? They are used quite differently and in different dosages apparently. Of course, I have no idea what levels etc; you need to talk to someone in the know and I need to find out more yet. I did read that one of the most effective dosages is Flexoril 5mg two hours before bed, increasing to 10-15mg if needed. Talk to your GP – if you can get this in the UK; I’m not sure you can. It’s an old, inexpensive drug apparently so it would be a good one to trial maybe if you can. Weak evidence meds include SAMe, growth hormone, 5HT (5-hydroxytryptamine). No evidence at all these will help with CSS: opioids (like codeines, morphines, although I note Tramadol above?? ), steroids, NSAIDs, diazepines or guaifenesin. NAC To Lower Central Sensitivity Syndrome? Phew. I think we’ll leave it there. Hopefully, that is enough to get your appetite whetted. For more info, do watch the Prof Clauw video Chronic Pain: Is It All in Their Head? It’s very good.